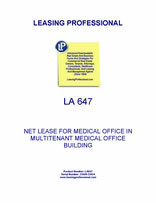 This lease form is designed for a medical office tenant (doctor's office) taking space in a multi-tenant medical office building facility. The lease is net in character, grants the tenant a renewal option at fair market rentals, provides for reserved parking for the tenant, and contains environmental protections for the landlord. 3.2 PREMISES. Landlord hereby leases to Tenant and Tenant hereby leases from Landlord, for the Lease Term, at the Rent (as such terms are hereinafter defined), and upon the terms and conditions hereinafter set forth, the commercial medical office space described in the Basic Lease Provisions designated by diagonal lines on the Floor Plan attached as EXHIBIT "A" hereto, and incorporated by reference herein (the "Premises"). 3.2.5 Landlord shall be required to complete any improvements to the Premises required by State and local municipalities to bring the Premises in compliance with the Americans with Disabilities Act and/or state and local fire and life safety laws. Except for the foregoing requirements and for punch list items addressed to Landlord in writing within thirty (30) days of occupancy by Tenant, Tenant accepts the Premises on an "as is" basis. 5.1.4.1 Base Rent, Parking Rent and Storage Rent shall be adjusted at the inception of the option period to "Fair Market Rent" as hereinafter defined, but not less than the Base Rent for the immediately preceding period. Fair Market Rent shall be deemed to include an allowance for market tenant improvements for the extended term, which amount shall be credited against Base Rent during the first year of the option period as set forth in the Tenant Improvement Manual. 5.2.1.1 "Taxes" as set forth in Section 6.1. 5.2.1.2 "Utilities and Services" as set forth in Section 8.1. 5.2.1.3 "Insurance" as set forth in Section 9.2. 5.2.1.4 "Common Area Expenses" as set forth in Section 18.1. 5.2.2.1 Commencing with the first full calendar month after the first Lease Year, Tenant shall pay as Rent an amount equal to Tenant's Proportionate Share of Excess Expenses. Such payments shall be made in monthly installments as reasonably estimated by Landlord from time to time. It is the intention of the parties to estimate the amount of Excess Expenses for each calendar year and Tenant's Proportionate Share thereof, and to make an adjustment in the following calendar year based upon Excess Expenses incurred during the preceding year. 5.2.2.2 After the end of each calendar year, Landlord shall deliver to Tenant a statement setting forth Tenant's Proportionate Share of the Excess Expenses for the preceding calendar year. If Tenant's Proportionate Share of the Excess Expenses for the previous calendar year exceeds the total of the estimated monthly amount of Excess Expenses paid by Tenant for such year, Tenant shall pay Landlord the amount of the deficiency within thirty (30) days of receipt of a statement indicating the amount due. If the total amount of Excess Expenses paid by Tenant exceeds Tenant's Proportionate Share of Excess Expenses for such calendar year, Landlord shall credit against Tenant's next monthly installment(s) of Rent an amount equal to the difference until the credit is exhausted. If a credit is due from Landlord to Tenant on the date of termination of the Lease, Landlord shall pay to Tenant the amount of the credit, reduced by any amounts payable by Tenant to Landlord, within thirty (30) days of the date of termination. The obligations of Tenant and Landlord to make payments required under this Section 5.2. shall survive the termination of the Lease.